Aikido is a Japanese martial art developed by Morihei Ueshiba as a synthesis of his martial studies, philosophy, and religious beliefs. Aikido is often translated as ‘the Way of unifying (with) life energy’ or as ‘the Way of harmonious spirit’. Ueshiba’s goal was to create an art that practitioners could use to defend themselves while also protecting their attacker from injury. Aikido derives mainly from the martial art of Daito-ryu Aiki-jujutsu, but began to diverge from it in the late 1920s, partly due to Ueshiba’s involvement with the Omoto-kyo religion. Many of Ueshiba’s senior students have different approaches to aikido, depending on when they studied with him. Today aikido is found all over the world in a number of styles, with broad ranges of interpretation and emphasis. However, they all share techniques learned from Ueshiba and most have concern for the well-being of the attacker. 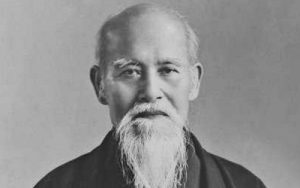 One of Ueshiba Sensei’s most talented students was Gozo Shioda, who went on to begin the Yoshinkan style of Aikido. 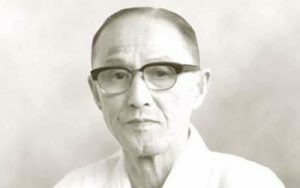 Gozo Shioda, born in 1915, studied and earned a 3rd Dan in Judo while still a teenager. He then discovered Morihei Ueshiba’s school and immersed himself in an eight year full-time, intense study of this new martial art. He readily mastered Ueshiba’s teachings and was eventually awarded Aikido’s first 9th Dan. The tremendous popularity of Aikido in Japan probably dates back to 1954 when an exhibition of Japanese martial arts was organised in Tokyo. Masters of many Japanese martial arts participated but Shioda’s astonishing demonstration resulted in his easily attaining the top award. As a result of his exhibition many sponsors offered support and so Gozo Shioda’s now-famous Yoshinkan (‘House for Cultivating the Spirit’) Dojo was firmly established. Yoshinkan Aikido is occasionally called the “hard” style because the strict and sometimes gruelling training methods are a product of the pre-war military period Gozo Shioda spent as a student of Ueshiba O Sensei. Yoshinkan Aikido uses six fundamental training movements and about 150 common defensive techniques which are practiced repeatedly. Mastering these basics conditions enable students to be able to execute the remaining techniques, which are thought to total about 3000 in all. Yoshinkan Aikido is not a sport. It is the cooperative development of both physical and mental dexterity. But there is also an incredibly powerful and practical self-defence side of Aikido that is available to all, irrespective of size, age, gender, race or culture.